The Ceramic Art collection of Chalre Associates came about through the efforts of the firm's principals, Rebecca Bustamante and Richard Mills. It is intended that a significant portion of The Chalre Collection become property of a museum foundation or other public body in the future. Celadon Stoneware is easily one of the most popular and longest-lived pottery types ever produced in China. The style is thought to have originated during the Five Dynasties period (907 - 960). Its Chinese name, Qingci, translates as "greenish Porcelain." Celadon Ceramics are often described as minimalist in design, usually lacking cluttered decoration. As the skill of the potters increased over the centuries the glazing took on a magnificent jade-like appearance and texture. Longquan County in Zhejiang Province is considered to be the most important producing region for Celadon ceramics. Most of the pieces in The Chalre Collection were produced in this region. The name Celadon is a European word with a strange story for how it came to be used. Celadon was originally the name of the hero of a romantic story called L'Astre written in 1610 by French writer, Honore d'Urfe. The hero in the stage production dressed in green and the colour became all the rage in Europe. It was around this time that Chinese Qingci Ceramics made their debut in Paris to great acclaim. Everyone compared its deep green to Celadon's outfit in the play and started calling the Porcelain "Celadon." France being the style-leader of Europe at the time, other countries followed along. 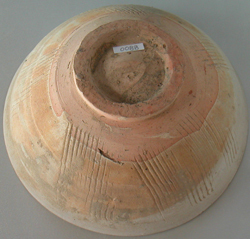 The Celadon bowl is decorated with a floral design on the inside cavetto. It has a combed incised design on the outside. It is coated with a thick brown glaze that does not cover the foot rim. 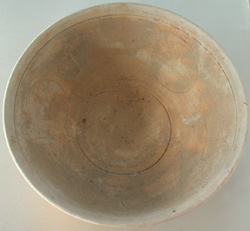 The artifact was produced in China, probably in the region of Longquan in Zhejiang province. It was brought to Southeast Asia as a valuable trade-good probably by an ancient Chinese trading ship that later sunk into the sea. After many centuries, the piece was rediscovered by deep-sea excavators of the shipwreck and subsequently acquired by The Chalre Collection through a registered dealer. Produced in the Sung Dynasty period (960 - 1279). Similar and/or identical artifacts are found in various publications dealing with Asian Ceramic Art including: Chinese Ceramics, Guangdong Ceramics and possibly The Art of Chinese Ceramics and Song Dynasty Ceramics. Other similar or identical examples can be found in publications dealing specifically with ancient shipwrecks excavations. Good examples are Lost At Sea: The Lena Shoal Junk and The Pearl Road: Tales of Treasure Ships. Similar and/or identical items are also on display at the Victoria & Albert Museum in London (UK), the Asian Art Museum in San Francisco (USA), the National Museum of Malaysia (Kuala Lumpur), the National Museum of the Philippines (Manila) and other museums throughout the world with diverse collections of Asian ceramics.